Re-Imagining U gives UNMC and UNO employees the opportunity to customize their learning and skill development in a way that is right for them. The courses are offered repetitively over two semesters each year. Content is derived from needs indicated for employees and leaders in our current strategic vision and employee engagement surveys. Courses are offered either individually or in a cohort format. In addition to regularly appearing content, Re-Imagining U will also feature one-time speakers and topics – called Electives. The Electives will cover deeper discussions, trending leadership topics, and equity, diversity and inclusion learning. · BRAND New 400 & 500 Level Electives - Intriguing trends in the Psychology of Money, Sustainability, Black History Month & Women's History Month events and more! See the new Spring 2019 Catalog HERE and REGISTER HERE. Re-Imagining U has courses to meet the needs of every employee regardless of where they are in their development journey. They are offered in different levels to help you easily identify the right courses for you. All UNO employees are welcome to register for the classes offered at UNMC campus and all UNMC employees may register for the classes held on the UNO campus. Travel would need to be accounted for when discussing with your leader the amount of time needed to attend the sessions. Courses will be offered repetitively over two semesters each year that run Sept/Oct/Nov/Dec and Feb/Mar/Apr/May. A new course catalog will be published each semester. Registrations may be limited on some courses but the majority of courses will be open enrollment. Courses in the catalog do not list room locations. In the new registration system, you will receive a registration confirmation as a calendar invite in your Outlook which will contain the location information. You will also find that information housed in the registration details. To ensure adequate coverage of business needs, be sure your manager approves your attendance prior to registering. 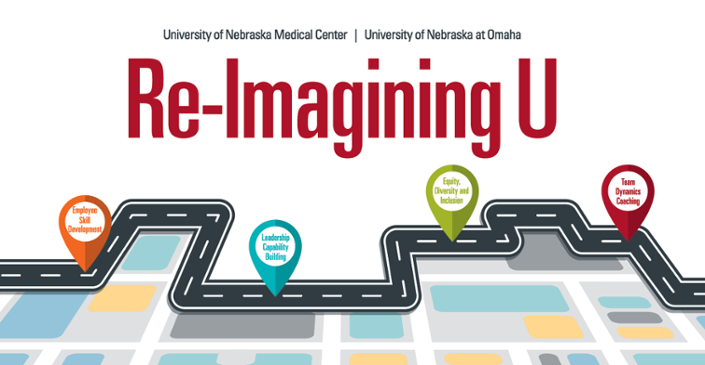 Go to the Training Registration page and select Re-Imagining U UNMC & UNO, then Spring 2019. PLEASE REMEMBER. Before registering, review with your leader all of the courses you want to take and discuss how they connect into your development plans. Work with your manager or supervisor to ensure coverage during your time out of office and to plan accordingly so that all employees will have a chance to attend courses. Employees engaging in the Re-Imagining U program will have access to a comprehensive selection of development courses. Courses can be taken independently, as desired, or as part of a prescribed track. Specific tracks of courses have been laid out with prescriptive courses that, when combined together, will elevate the learning experience much more intentionally. Initially, tracks will focus on leadership. New tracks will become available in the future. You will find the current tracks on the last page of this semesters Course Catalog. Who do I contact if I have questions or need accommodations to participate? UNMC Employees: If you are attending a session at the UNO campus, please refer to the map below, you may park in the UNO lots marked Y or Z on the north side of Dodge Street. Please ensure that you display your UNMC parking permit. Not all courses hosted in the Community Engagement Center will have spots available for all attendees. If the attendant routes you to a different lot, then they are full for the day. Some courses this semester will be held in the Milo Bail Student Center, those courses do not have access to the Community Engagement Center Parking lots D & E.
UNO Employees: If you are attending a session at the UNMC campus, please print the attached parking permit and display in your window. You can park in any designated student lots. If you have questions please call parking at 402-559-8580. Please see UNMC parking map below. The Office of Training and Development uses the UNMC & UNO Employee Engagement Survey to tailor training and development content for these courses. Q: Is sign-up required to attend a course? Q: Do I have to have approval from my manager to attend courses? A: Yes. Please ensure that you speak with your manager prior to signing up for a course to ensure office coverage needs are met. Q: How do I cancel a course I am no longer able to attend? A: Log back into the registration system and cancel the course in your My Account window. Q: Is there a cost to attend training? A: Most training opportunities are free for UNMC and UNO employees. If there is a cost associated to a training course, it will be noted in the course description. Q: If I am a UNMC/UNO employee, can I attend a training on the UNO/UNMC campus? A: Yes. All employees are welcome to attend any of the classes offered at either campus with a few exceptions. If you are interested in a course, please check the "intended for" column in the course catalog. Here is where it will show if a course is targeted towards a specific campus. Q: How do I make an appointment to set up one of the custom 300 level courses for my department? A: Please contact Diane Ratigan, diane.ratigan@unmc.edu. Q: Do I have to follow the courses listed on a track in order to be allowed to attend? A: No. If an employee does not want to stay on a certain track, they can earn hours toward the Re-Imagining U Certificate at different levels based on the number of hours of training they have completed in the year. Q: Are Re-Imagining U classes open to students and the public?